House Minority Leader Nancy Pelosi of Calif. accompanied by Rep. Adam Schiff, D-Calif., ranking member of the House Intelligence Committee and others members of the congress speaks during a news conference on President Donald Trump's meeting with Russian President Vladimir Putin in Helsinki, on Capitol Hill in Washington on Tuesday, July 17, 2018. For the first time this cycle, a leading elections forecaster has given Democrats a greater than 50 percent chance to reclaim the House of Representatives in the 2018 midterms, CNBC.com reported. 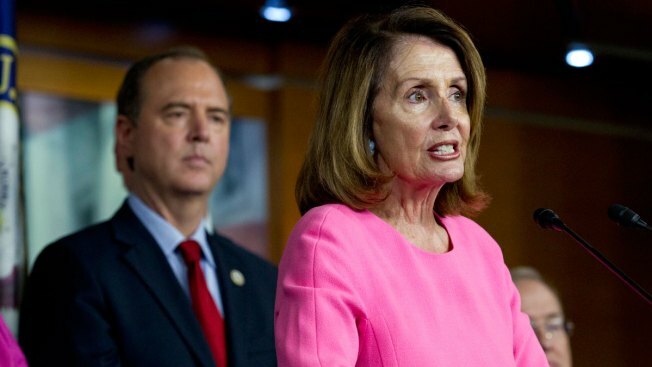 An analysis by Sabato’s Crystal Ball, a service of the University of Virginia's Center for Politics, published on Tuesday shows the House tilting past 50-50 odds in favor of the Democrats taking it back. The party needs to flip 23 seats this fall in order to regain the majority they haven't held since the first half of President Barack Obama's first term.